Reporting Officer should record the movements as 0.D. in AEBAS portal. On any particular day, while returning from 0.D., if it is beyond office hours, the Officer shall report the fact to his Reporting Officer next day for manual updation in customis. application which will be developed in CFMS. In case when the device is not available in the location of visit, the Reporting Officer shall mark O.D. in advance at AEBAS portal (or) manual updation in customised application of CFMS. In case when an Officer /Staff visits uncovered villages or on emergency tours, the Reporting Officer shall give ex-post facto permission and rnanually update OD in customised application which will be developed in CFMS. Till that time, Head of the Office shall give permission on file. 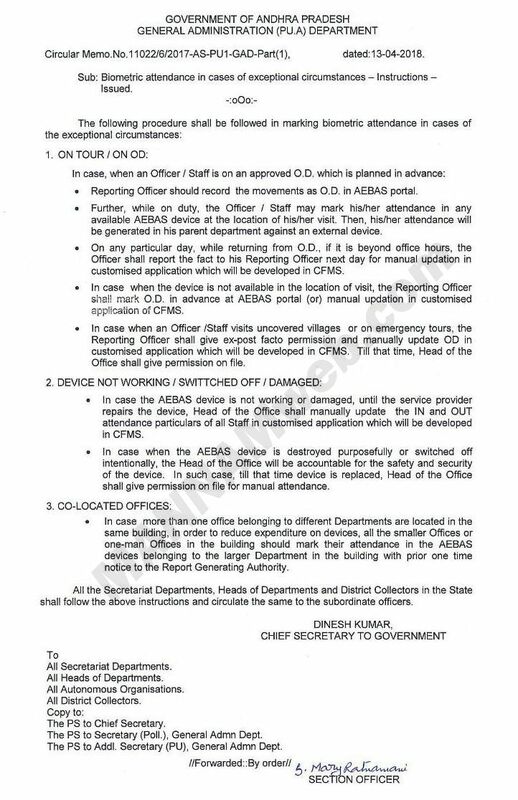 In case the AEBAS device is not working or damaged, until the service provider repairs the device, Head of the Office shall manually update the IN and OUT attendance particulars of all Staff in customised application vfiich .11 be developed in CFMS. In case when the AEBAS devi. is destroyed purposefully or switched off intentionally, the Head of the Office will be accountable for the safety and security of the device. In such case: till that tirne device is replaced, Head of the Office shall give permission on file for manual attendance. 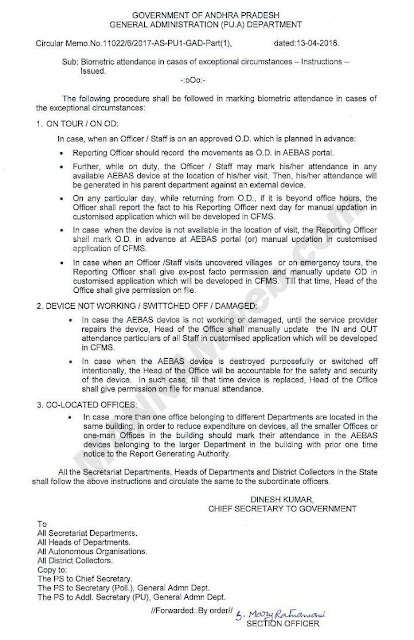 In case more than one office belonging to different Departments are located in the same building, in order to reduce expenditure on devices, all the smaller Offices or one-man Offices in the building should mark their attendance in the AEBAS devices belonging to the larger Department in the building with prior one time notice to the Report Generating Authority.